Today . . . I am thinking about the thought-provoking quote that the Original Samurai Teddy Bear left in response to my blog on May 1st. Cultivating Our Inner Samurai, Part 4 post was on developing intuitive judgment and understanding for everything. For whereas the mind works in possibilities, the intuition works in actualities, and what you intuitively desire, that is possible to you. Whereas what you mentally or "consciously" desire is nine times out of ten impossible; hitch your wagon to a star, or you will just stay where you are. So what does D.H. Lawrence mean when he says "the intuition works in actualities?" What exactly is actuality? According to the Collins Concise Dictionary, actuality means true existence, reality. A fact or condition that is real. Holy Smokes! Do you get this? Intuition is a condition that is real! Real! Not just some back-room mumbo jumbo. Page 5 in A Dictionary of Philosophy, interprets actuality to mean the actual existence of something in space and time. Much more than a possibility of existence. An actual existence! Intuition is real and it exists. In A History of Philosophy, actuality is interpreted in Book II of Hengel's Science and Logic to mean the "unity of essence and existence:"
The category of actuality [sic] is described as the 'unity of essence and existence'. That is to say, the actual is the inner essence [that] exists, the force which has found complete expression. ... Being as actuality is the unity of the inner and the outer; it is essence manifesting itself. Essence manifesting itself! How's that for the Law of Attraction at work? What great news! What all this means is that our intuition, our inner Samurai, is based in reality. Not possibility. Reality. Our mind, doesn't know squat. Though, our intuition does. This is a fascinating topic, with such profound implications. Weigh in. let me know what you think . . . what you intuitively know. 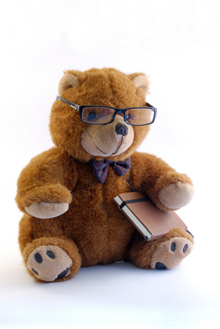 Thanks, the Original Samurai Teddy Bear for getting us started down this path of thinking. Love this line of thinking. Intuition so often holds the key, even when so-called rational or logical thought doesn't agree. Trust your intuition are some of the finest words ever uttered! I also loved the Otters on the one of the previous blog posts. Great picture, great flim clip, wonderful post. Agreed Jeanne. Trust, stand on, quit questioning, your intuition. "I know in my knower," a friend of mine used to say when I asked her how she knew something. She was right. Thanks, Bren for your example. Thanks for this article. I've been building up my intuitive muscle so to speak by just posing simple questions that require only a "yes" or a "no." If I feel stuck, I simply ask "Am I asking the right question?" and go from there. Trusting my intuition and knowing it is reality continues to be an enlightening process. 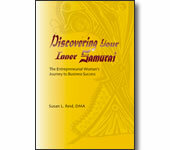 What a fantastic way to quickly tap into your intuitive knower--your Inner Samurai, Linda. I especially like your "Am I asking the right question?" query. Sometimes there are better questions that we could ask--questions that are more in line with our greater knowing. Thanks for sharing.